We know that cells are the building blocks of life, and we know about the parts of a cell that make it work, but what do we know about how all those parts make cells work? Right now, not much. 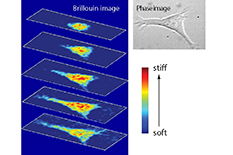 Researchers at the University of Maryland (UMD) are on the case, though, and they have invented a nondestructive and nondisruptive method for observing cells and measuring their mechanical functions using light. When light hits an object, it changes color, or wavelength, and this change in color can provide information on the mechanical properties of the object the light hit. This process is called Brillouin Scattering. The research team has invented a high-resolution module, “ Cost Effective Brillouin Scattering Retrofit for Confocal Microscopes,” which can be attached to microscopes and allows them to quickly measure wavelength changes after light passes through a cell without interfering with the cell’s function. The invention team includes: Scarcelli; Jitao Zhang, post-doctoral researcher in the Fischell Department of Bioengineering at the A. James Clark School of Engineering; and Milos Nikolic, Ph.D. student in the Fischell Department of Bioengineering and the Institute for Physical Science and Technology (IPST).